(CBS) MANCHESTER, N.H. - A New Hampshire auto dealer recently discovered some unusual damage to a handful of pickup trucks on his lot. 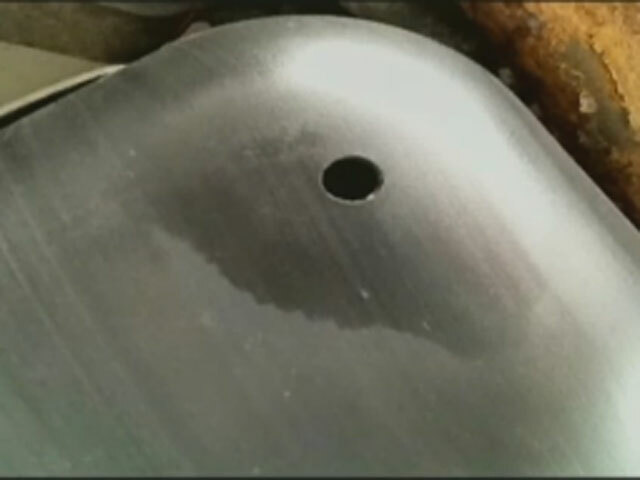 Police say thieves drilled holes in the vehicles' gasoline tanks and siphoned the fuel over the weekend, CBS Boston reported. Manchester police say the owner of Empire Automotive Group found four parked pickup trucks with holes in their gas tanks Monday morning. The trouble was first spotted when a customer was interested in one of the trucks. But when workers brought it over, the truck suddenly ran out of gas, CBS Boston reported. Upon closer examination, police determined the gas tanks to the vehicles had been drilled out, and the gas was drained. Dealership owner Randy Miller says replacing the tanks will cost around $7,000. "Its a significant hit for us, not so much for the gas - if that's all that was taken it really wouldn't have been that big of a problem for us," Miller told CBS Boston. The dealership will beef up security with added lighting and cameras.